The recent news of La Scala commissioning an opera to be based on Al Gore's An Inconvenient Truth from Giorgio Battistelli has raised a few eyebrows (and nasty comments from "low brows" as well). I can't imagine a less musically-inspiring character than Al Gore as the "hero" of this or any other opera. Yes, his speaking voice is resonant, but it is not at all musical (I would call his voice type a deep monotone). I imagine that Battistelli would be able to do a fine job of giving a sonic picture to the concept of global warming (perhaps even using musical material derived from the data that the Gore power points represented in the film), which takes care of everything he needs to be concerned with except the plot and the characters, who, because it will be an opera, will be expected to sing. At least Battistelli has a while to figure it out. Maybe by 2011 the threat of global warming will be history. Who knows? Thanks to the influence of Patty, I have spent far too much time this morning watching cartoons from the early 1930s by William Hanna and Joseph Barbera (yup--the people who made the Flintstones). This film is part of an early joint venture that they called the Van Beuren Studios (you can read all about Hanna and Barbera here), and looks like it might have served as an influence for my beloved Harold and the Purple Crayon. Make sure to watch the very spicy and brilliant (though occasionally offensive) Opening Night on Patty's site as well. I watched a segment of 60 minutes on Sunday that concerned the generation of people born during the 1980s and 1990s called the Millennial Generation or Generation Y. Yes, Michael and I fit into the demographic of "echo boomer" parents: we were born at the tail end of the "Baby Boom," our children (who are in college) use the appropriate technology, and grew up watching and believing Mister Rogers when he told them that "people can like you just the way you are." When I was growing up as a baby boomer, I watched Mister Rogers once in a while, but I didn't watch him every day, or even in color. I actually didn't like the show because I resented the character of Lady Elaine. Miss Jane on Romper Room never said my name, and none of my peers were named Elaine, but Mister Rogers gave my name to a character that was ugly and mean. I took it as a personal offense. It took years to desensitize me. Anyway, back to the point of this post, millennial musicians. I, as a late string bloomer, have enjoyed the opportunity to play with young people as colleagues. My technique on the violin when I was in my 30s didn't hold a candle to the technical abilities of the teenage stand partners I would sit with in my community orchestra. I had utmost respect for children who could play in tune and with a good sound. I still do. When I play chamber music with people old enough to be my own children, I think of them as musical equals. I really enjoy it when people who are old enough to be my parents think of me as a musical equal when we are playing together. Music, unlike most things in life, has a way of eliminating generational differences. This "millennial" generation of musicians seems to have pretty much the same kinds of concerns as the musicians of the "boomer" generation I grew up with. We are all faced with the same kinds of phrasing questions rhythmic problems, and physical concerns. There are differences, though, and I think of the differences as benefits. Growing up in a system that boosts self-esteem helps prepare musicians for the kind of constant competition (and constant failure) that is the "currency" of finding a place in the musical world. Nobody can stand up and play for a group of people without a strong sense of self, even if it is a sense of self that is in constant need of reinforcement. When I was approaching adulthood, I knew a great many excellent musicians who were fine and well-respected teachers. Very few of them were "nurturing." Many of them, the ones who cared about their students at all, were downright intimidating, and as young people we had to be prepared to face them week after week. We lived in a kind of fear that we wouldn't ever be good enough to please our teachers. The generation of teachers teaching the now "millennial" musicians is a nurturing generation. Perhaps they don't want to repeat the cycle of intimidation that they experienced from their teachers, or, perhaps the older ones have softened over time. Students now confide in their teachers, and as a result, they develop a kind of musical support system that will help them through the struggles of trying to make a living as a musician. Students who are in colleges and conservatories now expect their private teachers to act as counselors and advisers, and those teachers are usually very willing to do everything they can for their students. I contrast this with the behavior of one of my teachers who told me that I needed to make my own way in music. When I asked this teacher if s/he thought I had any talent, that teacher's response was that I should see a psychiatrist. Being a good student, I took that advice to heart, and spent most my sessions questioning why this teacher would either not show up for lessons, or run out of time when it was my turn to play. People do have to create their own musical opportunities now. Getting into a symphony orchestra is only one possible (or nearly-impossible) career path for a young musician. Young people know that the marketing skills they must develop in order to survive (particularly using technology to their advantage) as musicians can easily be translated into other fields of work that can supplement their musical habits. Young musicians are aware of how difficult it is to have a career as a soloist or a chamber musician, but many of them are willing to do whatever it takes to have one. The "playing field" is different. It is no longer male dominated, and it is no longer geographically limited. There are always new areas of specialization that people can carve out for themselves, and the quality of playing around the world has made its way into cities that used to be considered musical backwaters. There are image-making and enhancing tools that anyone can use, and the publicity tools that were once reserved for managers can be at the fingertips of anyone with the knowledge and desire to use them. It is easer to get in touch with people (which is one of the most difficult problems for musicians). Cell phones, the web, and e-mail have revolutionized communication in the business of music as well as the business of everything else. I notice that a great many "millennial" musicians are excited about playing new music, which makes me particularly happy since I am a composer. I also notice that they accept a wide range of musical "styles" as acceptable and desirable to play. When I was in my 20s there were a relative handful of "new music" people and "old music" people. There were also people who, for a time, only played music that was very old or music that was very new, but these were considered "fringe" groups. I now notice, among the 20-something musicians I encounter, that all music is treated as equal music, to be evaluated on its playability and its own merits. Beethoven is still Beethoven, Mozart is still Mozart, and Bach is still Bach, but I notice that this generation has less of a preoccupation with the desire to label something as great or revolutionary, and more of a preoccupation with trying to simply play well. 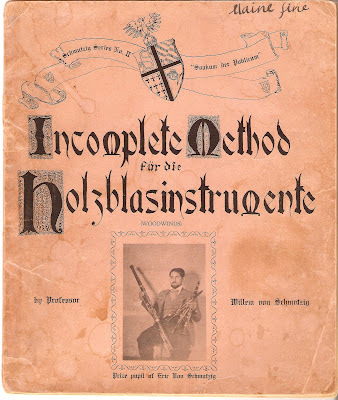 When I came across the Incomplete Method fur die Holzblasinstrumente by William von Schmutzig in my mother's library, written pseudonymously in 1951 by Arthur E. Goldstein, I immediately co-opted it as my own, carrying it around with me wherever I went, until it became downright schmutzig, as you can see above. Don't forget to make note of the inscription of my name in my finest italic 14-year-old hand (I had been a dedicated Osmiroid user since the third grade) in the upper right hand corner. To add miracle to wonder, my mother actually knew Arthur E. Goldstein when she was a student at Tanglewood. He later became a member of the Chicago Symphony Orchestra's horn section. 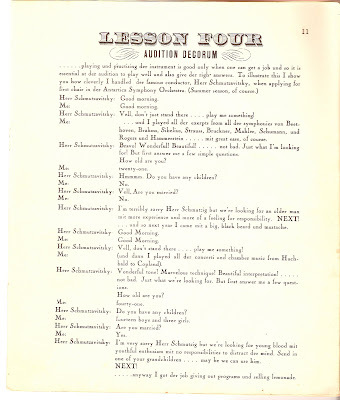 I had forgotten where my beloved Schumtzig method had gone, and yesterday, when I unearthed it from a box that was buried under a portable bookshelf (an old wine crate), I knew that I had to share some of it with the larger world. 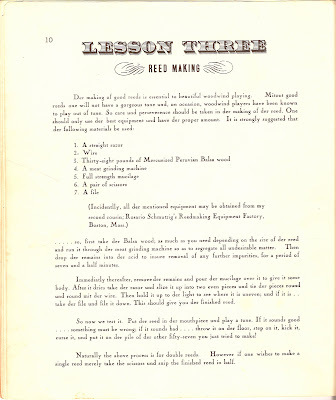 The advice on reed making and audition decorum is still current. The volume is even still in print and can be had for a mere five bucks! Here are a few samples that you can click on to see in more detail. It took me a long time to finally finish these Two pieces for Viola and Piano. They went through a lot during the past six months or so, changing names, changing instruments, changing shape, and adjusting to the various ebbs and flows of my inner psyche. I am happy that the problems I was dealing with while working on these pieces are finally resolved; and the pieces, which ended up being a kind of therapy for my own extra-musical struggles, are finally finished. Update: It is going to be performed on November 15th of this year at 5:00 p.m. in the Memorial Room of Smith Hall on the campus of the University of Illinois in Urbana, Illinois by violist Asli Gultekin, the piece's dedicatee, and pianist Remmington Clarke. I'll be there. Thanks to Chantal, I learned about this fantastic concert search (and concert broadcast) tool called Instant Encore. Thanks Chantal. That was a lovely Bach Double from Indianapolis. I have been enjoying a walk through the Past by way of the 1948 edition of Dale Carnegie's How to Stop Worrying and Start Living. Excellent musical and literary references abound in this book, but they are balanced by the 1948 world view concerning the place of women in society (and in marriage), as well as health advice that has been proven harmful in the intervening 60 years. I thought I'd share this reference to Gershwin in the chapter called "Find Yourself and Be Yourself:"
Be yourself. Act on the sage advice that Irving Berlin gave the late George Gershwin. When Berlin and Gershwin first met, Berlin was famous but Gershwin was a struggling young composer working for thirty-five dollars a week in Tin Pan Alley. Berlin, impressed by Gershwin's ability, offered Gershwin a job as his musical secretary at almost three times the salary he was then getting. "But don't take the job," Berlin advised. "If you do, you may develop into a second-rate Berlin. But if you insist on being yourself, someday you'll become a first-rate Gershwin." Article #2: it is not about being gifted or smart. There are plenty of morons who get really good at the cello. Maybe they get good because everything is hard for them, so they just apply the same nose-to-the grindstone ethic to the cello that they need for crossing streets, chewing with their mouths shut, and remembering to put their pants on before shoes. I was lavished with the titles of gifted and brilliant as a kid, and I was flattened by people who worked their asses off because talent and blah blah doesn't get you too far. I happen to know that most adult beginners (and Jen is a supreme example of this) are good at a wide variety of things, so the cello is particularly punishing because it rarely lends itself to innate technical ability. 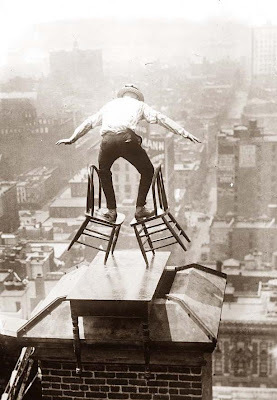 Article #3: unless you take time off, there are no backward steps. I am just filled with metaphor and simile today, so let's keep it up: I think of being proficient at the cello as this 3 dimensional picture that one can observe from many angles and distances. One day, it looks like the details, the next it looks like widespread tendencies. But it's all the same thing, just different aspects. So you pick up the cello and you're really relaxed. That means that you've explored what relaxation feels like in spring, with a wildfire in Pomona, tomato soup for lunch, and Leo in Cancer. Tomorrow? Everything is different. The more angles you are presented with, the more likely you'll be able to bob and weave with the changes life throws at you and your physiology. The key is to find what's common to the experiences and to develop the thread that ties your whole playing experience together. Article #4: What feels good will sound good. Even if it doesn't at first. If you hold these articles as true, and then apply them to your practice, you should gain the comfort of knowing that what you are going through IS the process. IS the norm. And if I can talk about this stuff at such length, and bloggers of all different strengths and abilities are chiming in, don't you think that there is a way to muddle inelegantly through it? Just by persisting? Then when you look back on this baptism by fire, the first time you are actually practicing the whole instrument and not just the notes, you will notice that there is definitely an elegance to simply nodding with patience and silently sharpening your resolve for another day of the Cello Life. And they apply to any instrument and for any life. 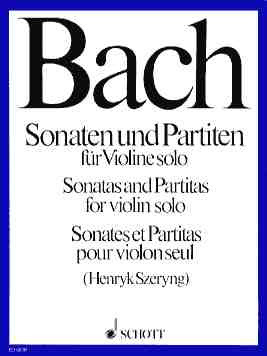 I guess it must have been 16 years ago, around the time I first started playing the violin, that I bought Henryk Szeryng's edition of the Bach Sonatas and Partitas because I loved the way he played them (you can listen to the first movement of the E-major Partita, as well as a lot of other music, on his My Space Page!). I love his (hypothetical) My Space friends: they're my kind of people. Of course Szeryng was well known for being a really arrogant person: the kind of artist who is best left as a personal mystery. I appreciate Marcel Harvey's comments over at the J.S. Bach Homepage concerning Szeryng's Bach recordings, and I would imagine that many of his 1877 MySpace friends are personally better off never having known the man. In most cases he either died before these friends were born or was born after they died. When I first started working on the Sonata and Partitas I was baffled by Szeryng's choices of fingerings. I simply couldn't do most of them, so I crossed out his fingerings, and replaced them with my own. Recently, after taking some time off practicing the Sonatas and Partitas (including many years of just not practicing the violin in favor of practicing the viola), and devoting at least an hour a day of the past three years to Sevcik, Szeryng's fingerings are magical. They make it possible for me to play in tune, be comfortable, and be expressive. I'm going to take a huge eraser and wipe the whole book clean. Now leave this post and spend some time listening to the fantastic recordings on Szeryng's My Space page! Lisa Hirsch wrote a great article concerning what she calls the "slow dismantling of the compositional gender divide" over at NewMusicBox. One of my violin students (the one I quoted a few days ago) came up with a lovely response concerning my analogy that keeping the two middle fingers of the left hand down whenever possible was similar to keeping two feet on the floor. He mentioned how much easier it was to balance on a log using two feet than it was trying to balance using only one. I couldn't find any satisfying photos of people balancing on logs, but I do find the above photo both satisfying and entertaining. I think that it illustrates the principle of a nicely-balanced violinist's left hand rather well. Violin playing is, however, a safer form of entertainment. I have really been enjoying Rosemary Watson's impressions of the newly-crowned queen of West Virginia, and just had to share! I don't know if this whole set of maps has any basis in reality, but it sure offers an alternative to maps of red states and blue states! You can read the article here. According to the map, I appear to be surrounded by agreeable, extroverteted, conscientious, and neurotic people who are not open to experience. The psychological crossroads of America! Sometimes it seems like it was only yesterday that I was in Vienna, engaged in a long conversation with a violinist from the Vienna Opera Orchestra who told me that music was no profession for a woman. Indeed, in the Vienna of the early 1980s, there were only a few performing organizations in Vienna that even considered hiring women. Now the Vienna Opera has appointed Albena Danailova as its concertmaster, which means a great deal to those who have endured the backward-looking attitudes towards women in the European orchestras. Here is a "transcript" of a post-lesson conversation I had the other day with a 14-year-old student who likes math, music, and scouting. This exchange morphed out of a discussion we had about air conditioning (which his father doesn't like to use in the summer), energy consumption, and renewable energy. ME: Wouldn't it be great if you could harness musical energy? HE: Or how about happiness--the happiness that comes from playing music? And you can always make more. I think that this kid has a bright future! I have always loved the Ave Maria that Charles Gounod wrote as an obbligato above J.S. Bach's C-major Prelude, BWV 846, from the Well-Tempered Klavier, so I fashioned my own obbligato atop another Bach Prelude, the Prelude BWV 999 in C minor. New Update: The first Mp3 is blank (it was a totally computer-generated recording that I have now removed), so make sure to click on the second one. I think about how much that is good in my life is due to just plain dumb luck. Sometimes it is even blind (in the case of my first date with my husband), and sometimes it is even deaf, when I have, by chance, picked a recording out of a record store bin (back when there were bins, records, and record stores) that turned out to be something really special. I have had dumb luck with instruments too. My (now ex) Powell flute was made for me, as was my (also now ex) Powell piccolo, and my Rod Cameron baroque flute. I didn't have the option to choose an instrument: my number came up, and I took what each of the makers came up with. There was luck involved in getting the orders for my flute and piccolo, however. My flute order (there was a four-year waiting list for Powell flutes back in the 1970s) was offered to me by a flutist I met at a concert in Stockbridge (actually Interlochen) Massachusetts one very hot and mosquito-rich evening in the summer of 1973. That particular flutist had a "matured" order for an instrument made by Haynes (back in those days the only "professional" were made by Haynes and Powell flutes) and one made by Powell. She chose to take the Haynes, and simply offered to turn her Powell order over to me. I took it, and I got a very nice instrument. In addition, for reasons that had nothing directly to do with playing the flute, that evening ended up being a pivotal one in my life. Shortly after I got my Powell flute, I thought it would be a good idea to order a piccolo. Powell had just started making piccolos after not making them for many years. It turns out that my mother, who was a flutist, put in an order for a Powell piccolo shortly before they stopped making piccolos during the 1960s. They told her that her order would still be considered viable when they started making piccolos again, so I was able to get a Powell piccolo within a few months. My violin, one of the last instruments that Douglas Bearden made before he died, has allowed me to grow into having the violin-voice that I have. That instrument was also made to order, and an example of blind and deaf luck. My first viola was a lucky garage sale find (no strings, no bridge, and no sound post for $100), and the viola I usually use was a gift. I love both of them. Some people say that you make your own luck. I think that things just happen. So much has changed during the last 49 years of my lifetime. (I just turned 49 the other day) Being in the right place at the right time used to be considered a primary component in "making your own luck." Now, with my physical distance I have from just about everything going on in the musical world that I so deeply want to still participate in, there is no possible way for me to "be" where I want to or need to be in order to make my own luck in the musical world. "Place" and "time" have extended meanings with the addition of the internet into our lives, so it is very lucky for me that you happened to find my "site" and can take part in my musings about the very luck that brought us together somewhere outside of physical time and place. Gee. Taking a day off practicing has probably taken a serious toll on my psyche. I had better get back to work. Thanks for "stopping by." And music criticism of unusual quality. Read the New York Times review of the first New York performance of Pelleas and Melisande back in 1908.